Click on this link or the picture below to view the animated version of our 2019 Easter card for all of our family, friends and followers. Read my companion article online: The Good Shepherd. This article is included in my latest devotion book, Thanksgiving Praise and the Names of Jesus, which you can download FREE in eBook format by following this link to Jim’s Books. Click on this link or any of the pictures to view the animated version of our 2018 Christmas card for all of our family, friends and followers. 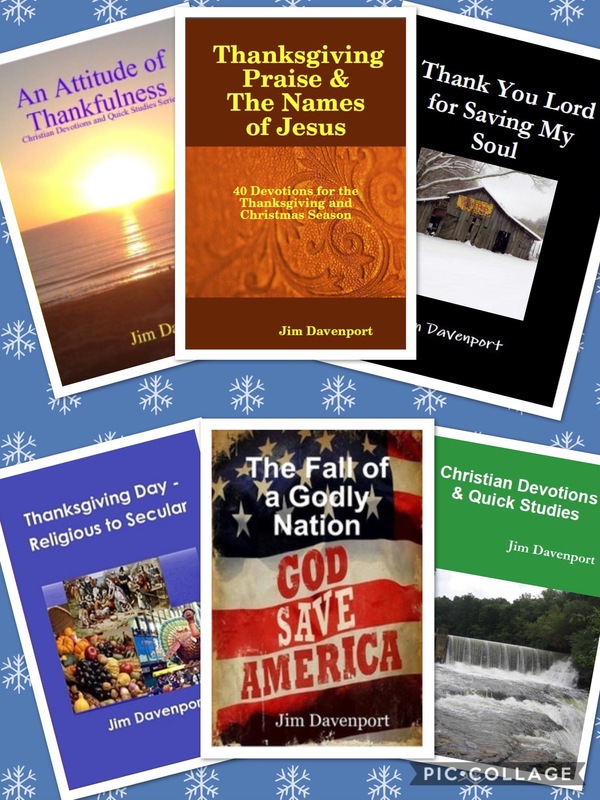 Our Gift to You – Download ALL Six of Jim’s eBooks FREE at His Bookstore!!! This includes Jim’s latest book “Thanksgiving Praise & The Names of Jesus“ consisting of 40 Devotions perfect for the Thanksgiving and Christmas Season. Click on this link or any of the pictures to view the animated version of our 2018 Thanksgiving card for all of our family, friends and followers. After you view the card you can also click on the words “Try Our Puzzle” at the bottom right below the card for a little Thanksgiving fun. Click on this link or any of the pictures to view the animated version of our 2017 Christmas card for all of our family, friends and followers. After you view the card you can also click on the words “Try Our Puzzle” at the bottom right below the card for a little Christmas fun. John 1:14 (ESV) – And the Word became flesh and dwelt among us, and we have seen his glory, glory as of the only Son from the Father, full of grace and truth. For an interesting background on the Christmas Carol “God Rest Ye Merry Gentlemen” which dates back to the sixteenth century, follow this link to Adam Miller’s Songtime. Click on this link for our animated 2017 Thanksgiving card for all of our family, friends and followers. Click on his link for our animated 2017 Easter card for all of our family, friends and followers. Click on this link or any of the pictures to view the animated version of our 2016 Christmas card for all of our family, friends and followers. When you view the card you can also click on the words “The Nativity” at the bottom right below the card for a little history on the origin of Nativity Scenes. The ceramic figurines in the Nativity Scene displayed on the mantle over our fireplace were hand-made, painted and glazed in the Pine Lake, Georgia workshop of the late Mrs. Mildred Melton by Charlotte’s late mother, Mrs. Frances Jones Lowery. They were presented to us as a Christmas present and have been cherished for many, many years. What a blessing to still have this most precious gift to remind us of our Savior and the affectionate love that Frances had for ALL of her family. Click on this link or the picture below for our 2016 Thanksgiving card for all of our family, friends and followers. Click on this link or the picture below for our animated 2016 Easter card for all of our family, friends and followers. Click on this link or the picture below for our animated 2016 New Years card for all of our family, friends and followers. Click on this link to view our 2016 Happy New Year card! You might want to try out the Puzzle after you view the card. You will find the link at the bottom left corner of the card. Click on this link or the picture below for our 2015 Christmas card for all of our family, friends and followers. May the celebration of His birth bring joy to you and yours during this Christmas season! As a special treat … here’s a beautifully prepared video rendition of Kari Jobe’s “Adore Him” … click on the start button below to view the video. Click on the above link or the picture below for our 2015 Thanksgiving card for all of our family, friends and followers. May you and yours have a blessed Thanksgiving Season!! Click on the above link or the picture below for our 2015 Autumn card for all of our family, friends and followers. Click on the link or the picture below for an animated version of our 2015 Easter Card for all of our family, friends and followers. Click on this link to view our Happy New Year card! You might want to try out the Puzzle after you view the card. You will find the link at the bottom left corner of the card. Click on this link to view our Fun Christmas Card. 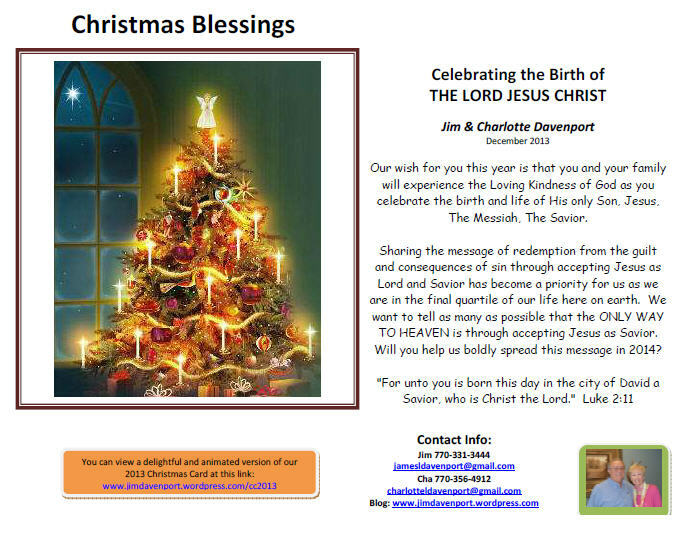 Be sure and come back to this page to view our Animated Christmas Tree card below. Click on this link or the Christmas Tree below to view an animated version of our 2014 Christmas Card prepared for our Family, Friends and Followers. Click on this link or the Christmas Tree above to view an animated version of our 2014 Christmas Card prepared for our Family, Friends and Followers. Click on this link or the picture below to view an animated version of our 2014 Independence Day Greeting Card for all of our Family, Friends and Followers. For the fun of it, you can solve the free puzzle offered at the end of the card. As our country pauses from its day to day activities to celebrate Independence Day, may you and your family experience the joy of the freedom that our forefathers fought for and won for each of us. May God Continue to Bless Our Nation! Click on this link or the picture below to view an animated version of our 2014 Easter Greeting Card for all of our Family, Friends and Followers. As the Easter season approaches may each of us remember why Jesus was crucified on the cross of Calvary and gloriously resurrected on the third day!! 3 He is despised and rejected of men; a man of sorrows, and acquainted with grief: and we hid as it were our faces from Him; He was despised, and we esteemed Him not. 4 Surely He hath borne our griefs, and carried our sorrows: yet we did esteem Him stricken, smitten of God, and afflicted. 5 But He was wounded for our transgressions, He was bruised for our iniquities: the chastisement of our peace was upon Him; and with His stripes we are healed. 6 All we like sheep have gone astray; we have turned every one to his own way; and The Lord hath laid on Him the iniquity of us all. 16 For God so loved the world that He gave His only begotten Son that whosoever believeth in Him, shall not perish, but have everlasting Life. 17 For God sent not His Son into the world to condemn the world, but that the world through Him might be saved. May you and your family have a Happy Easter as you commemorate the resurrection of Jesus, conquering sin and death! Click on this link or the picture below to view an animated version of our 2014 Spring Greeting Card for all of our Family, Friends and Followers. Spring 2014 – Click the pic above to view the animated card! We welcome spring after this long and cold winter season. The spring flowers are beginning to cover God’s creation with His heavenly array of colors. We stand in awe at what HE has done!!! Click on this link or the picture below to view an animated version of our 2014 St Patrick’s Day Greeting Card for all of our Family, Friends and Followers. Click the pic above to view the animated card!! We wish you a Happy St. Patrick’s Day! Charlotte’s great great grandmother was Irish and we celebrate her family heritage. Blessings to you and yours no matter your heritage. Click on the Castle to see an animated fireworks display. Click on this link or Edinburgh Castle to the right to view an animated version of our 2014 New Years Greeting Card for all of our Family, Friends and Followers. Please accept our best wishes that you and your family have a fulfilling 2014 that brings Glory to God! Click on this link or the Christmas Tree above to view an animated version of our 2013 Christmas Card prepared for our Family, Friends and Followers. TO HEAVEN is through accepting Jesus as Savior. Will you help us boldly spread this message in 2014? Books by Jim Davenport: Please consider the purchase of Jim’s books to help support his writing ministry. For a limited time, Jim’s Books are available at a special discounted price. Click the link below to preview, download and purchase.